Re-enter Patrick Heaney, the disguised Anchises of Golden Bough and the farmer with an eye for straight lines of Markings II. Heaney describes the impact of his bereavement: My father’s death in October 1986 was the final ‘unroofing’ of the world and I’m certain it affected me in ways that were hidden from me then and now. (DOD p322) This is helpful: Heaney is not composing a father-dedicated collection as such; Patrick Heaney will emerge from the shadows in poems that ‘came on at unexpected moments’ and threw up powerful associations (look for ‘roof’ and its cognates). A poem triggered by memory of a father’s supposed fishing tip (Catch the old one first … young ones will all follow). His idea of the wise or the humorous was met with rolling eyes amongst his children (old, and heavy and predictable). Delivered as definitive and unchallengeable (Bob’s your uncle) – fish would blunder into a trap just because he said so. Dearly remembered moments of low bright river evenings, the sweet time are now tinged with a keen sense of sadness – a childhood spent alongside a man accepting the duty of training his children – nipping cheek in the bud (afraid we’d take too much for granted), forestalling over-enthusiasm (our spirits must be lightly checked). … for his occasional laboured jokes now and then … make a splash, the leaping salmon ‘As big as a wee pork pig by the sound of it’. A piece linking three generations of the male Heaney chain – a ‘full-circling’ poem full of circularity and cycles evoking the ‘shades’ of dead father and grandfather. Set in the same landscape in earshot of the pool where the leaping salmon’s re-entry radiated silent ripples outwards from the centre (Back through its own unheard concentric soundwaves). Standing there a traditional reaper figure (forever on his scythe); he has mown a circular patch from the perimeter to the centre (a final perfect ring of sunlit stubble). He has a message for Heaney’s father as a boy to carry home: ‘Go and teII your father … I have it mowed to perfection (as clean as a new sixpence‘). A revenant himself Heaney watches the down-at-heel but obedient urchin (a barefoot boy with news), no taller than the surrounding vegetation, running at eye-level with weeds and stooks. The lone mower was the Grim Reaper at the centre of a clock-face. Carrying the message led to a shocking aftermath (the afternoon of his own father’s death) its grim reality concealed behind the open black half of the half-door of the family home. From afar Heaney can sense the sensations and feelings of that moment (I feel much heat and hurry in the air … legs and quick heels far away); he would experience them in his turn (strange as my own) on the day his father shouldered him as a child around the farm (piggyback me at a great height, light-headed and thin-boned) reversing of the Aenied account of Aeneas rescuing his ageing father like a witless elder rescued from the fire of battle. 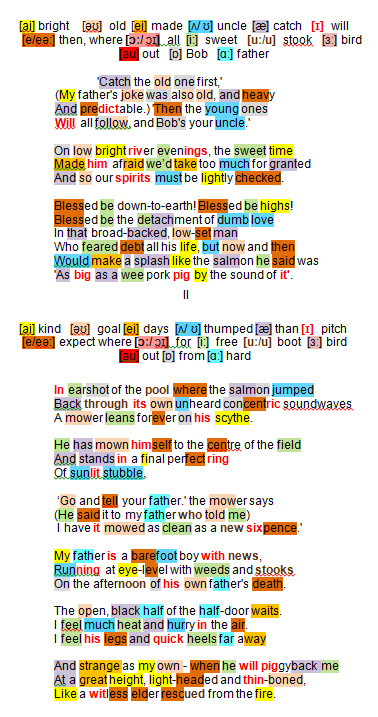 MP (217): A more sombre mood sets in, in Part Two of the poem which employs the present tense to show ripples of equivalence linking three generations, and to heighten the immediacy … In contrast to the salmon, leaping on its return to the spawning ground, a mower stands stock-still in the middle of a field. Part of time, rather than Time himself, he ‘leans forever on his scythe’, the centre of a dial on a stopped watch. Now, having known what it is to lose a father, Heaney can identify more fully with the emotions his father experienced … Reversing the positions in ‘The Golden Bough’, Heaney concludes with one last metamorphosis in which his father becornes Aeneas, and he becomes the ‘light-headed’, ‘thin-boned’, ‘witless elder’ in the translated extract from the Aeneid.